Poor Luke went to the great salad in the sky. 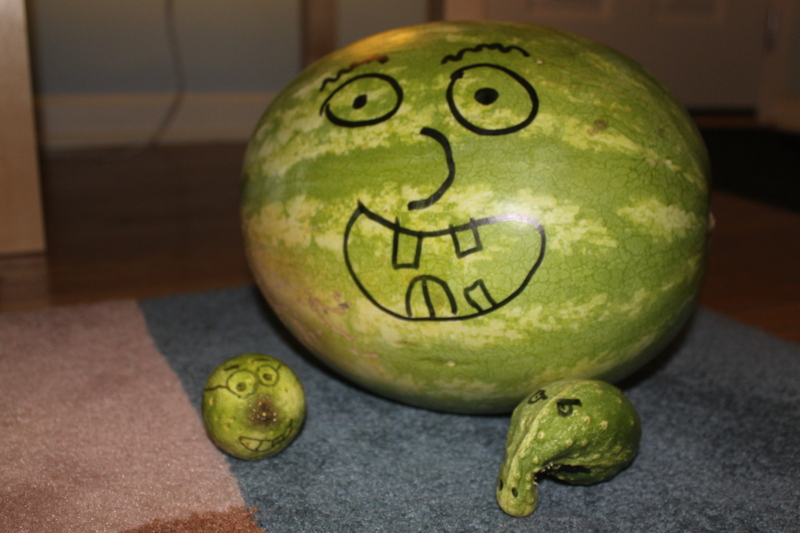 He was last seen chatting with his friends Knute the Cuke and Wally Watermelon. He was then abducted and carved up. Wally was brutally carved and eaten later. His green carcass was found in the garbage. Knute’s whereabouts are currently unknown. Donovan is currently investigating. This entry was posted in General, Luke the Cuke on September 3, 2011 by neepandtattie. Based on the Rufener’s scandal Donovan should be a prime suspect and you have him doing the investigation? Then again where was Mom? This just in! DNA evidence from the utensils used to kill and eat Wally points to none other than Elyse “The Watermelon Killer of Marion Rd” Galizio. Donovan would arrest her but he is too busy loving on her.